Once Honest Husband and I finally decided to dive head-first into a kitchen remodel, the question of what to do with the cabinets was (understandably) the very first concern we needed to address. We wanted the remodel to be significant enough that we wouldn’t feel compelled to do it all over again after ten years, but we needed to stay within a pretty modest budget (right around $6,000—$5,000 for the cabinets, and $1,000 for the flooring. We’ve managed to stay pretty close to that budget. More on that later.). All of the labor and work would be done by my husband, with me providing modest backup support (we’ve been really lucky and had lots of babysitting by my mother-in-law during this project, so I’ve had several days where I was free to actually help—sweep, vacuum, make food runs, supply paper towels, hold tape measures, give feedback), and it had to be work that could be completed either on the weekends, or in that glorious hour in between when our girls went to bed and when we did. Knowing that my favorite style of kitchen cabinetry is a simple Shaker, Honest Husband (who is in love with his router, and seriously tried for months to talk me into a more complex design, I think just so that he could use it more. To be fair, it is a pretty sweet tool) at first suggested painting out all of the cabinet boxes, then building new doors for all of the cabinets. He figured the doors would be a project that he could tackle himself, with the help of his dad’s old table saw (having a mechanic/contractor for a father-in-law is a really big advantage) and some relatively cheap (but still better than builder grade) lumber. But then I told him that I’d really like the old pantry to be removed and the entire kitchen opened up to the family/play room. The pantry obscured my view from the kitchen to the playroom when I stood at the sink. And the cabinet box under the sink needed some serious rebuilding after we discovered old water damage (and a little bit of mold. Again, more on that later.). Also, the (empty) cabinet above the microwave needed to come down to make room for the new range hood. That awful microwave. It was only 9″ above the cooktop! 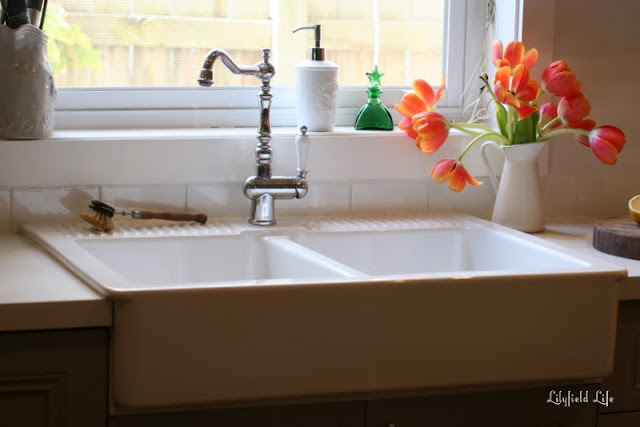 And the sink that we both fell in love with (an Ikea farmhouse/apron front sink. The only one we found that had the attached drip rail in the back where I could set sponges and soap—a major advantage for finding cheap countertops, too. Without the necessity for a large hole cut into a single piece of countertop, the square footage needed for the kitchen countertop was cut way down) was 36” wide, not 33”. And, well, so long as we’re talking about what we’d ideally like to see, there’s the issue of that soffit . . .
That was when I started to suggest Ikea cabinets for the whole kitchen. So, we started researching all of the different cabinet styles and options that we found and liked. 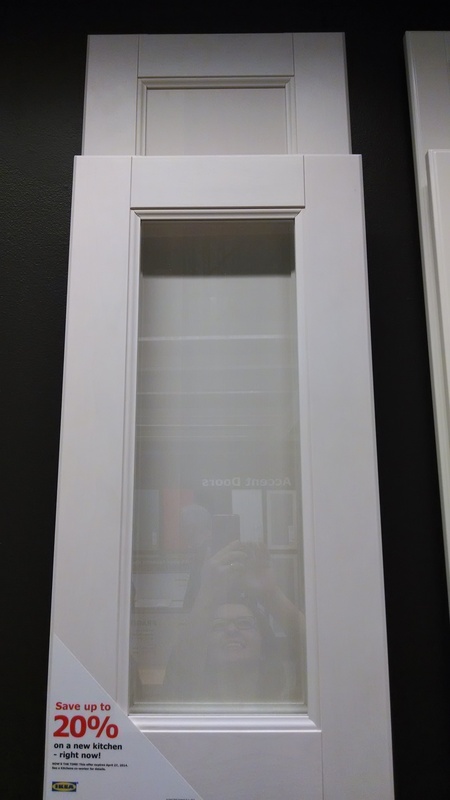 We wandered through the kitchen sections at big box stores, snapping photos and grabbing cabinet samples that we liked. He leaned towards a more traditional, raised panel design, worried that my simple Shaker style would look too clean, too plain. We compromised after finding these cabinets on display at our local Lowe’s. They were Shaker with a twist. An extra detail of routing around the inside frame. Shaker and stirred. It was perfect. KraftMaid Sonata cabinets, available at Lowe’s. But I was still unconvinced that having my husband build the cabinets was really the best solution. Please know, I wasn’t in any way hesitant about his abilities, or about the quality of work that he would generate. I knew anything that he built would be incredibly durable, overbuilt, even. I knew that it would be measured precisely, and give the whole room a custom look, fit, and feel. But I also knew that I didn’t want to live with him while he was building these cabinets. I know the level of perfectionism and obsession that my husband possesses. I knew that every not-entirely-square corner of the kitchen walls will be discovered and thoroughly cursed. I knew that he would break out his calipers in order to build cabinets with indistinguishable uniformity. I knew that he would spend hours in the garage, leaving me to watch the girls while they scream for daddy, and telling them that they just can’t help daddy right now because he’s working with nails and glue and saws and heavy lumber and all kinds of dangerous things. I knew that I’d start to resent him. Even while he was working to give me this incredible gift. So I kept saying it, “Ikea.” I pointed out every kitchen I saw on the television (most of them are made with Ikea cabinets. Just about every advertisement that is filmed in a kitchen is filmed in front of Ikea cabinets. Also, even high end remodeling shows like “Property Brothers” use Ikea cabinets). I looked up pictures on Houzz. I found every DIY, lifestyle, remodeling blog I could find. I slipped the suggestion into every conversation we had about the kitchen. “Ikea.” He started reading a few of the testimonials I had talked about. He looked through Ikea Hackers, and Ikea Fans. He read articles on how Ikea constructs their cabinets. Suddenly, he started talking to me about how the construction of the boxes for Ikea is the same as for the big box stores, as for custom cabinetry. He started to research hardware, and found that the hardware Ikea uses is considered some of the best around. Especially for the price. He started to think about ordering doors from some of the companies that specialize in replacement doors for Ikea cabinets. 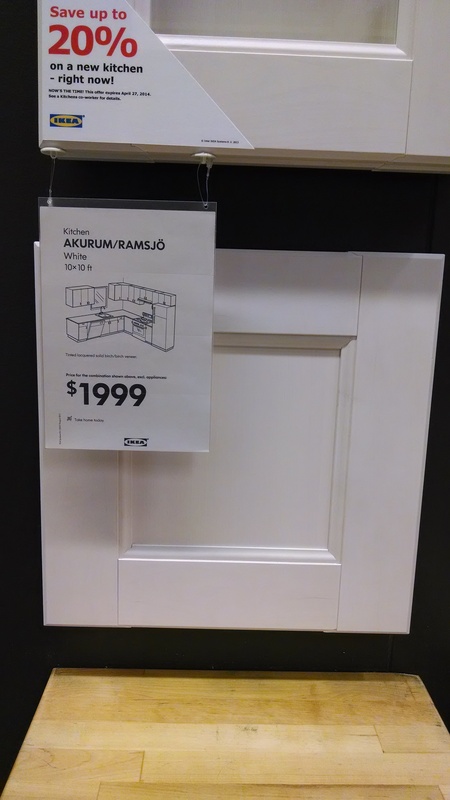 But after pricing those out, we started to look at the options available from Ikea itself. It had taken months of convincing, cajoling, arguing, suggesting, needling, guiding. But I had him. Now all we had to do was design the damn thing. He had been talking about the prospect of us moving back to town with a friend of his who is a realtor, and she told him about this property. He said that it sounded perfect. Skeptical (and still not entirely sure we were ready to make the big move across state lines), we came over for the weekend, “just to look.” It was the first home we had ever toured together (my husband had purchased our first home fresh out of college), and what can I say? The old man was right. It was our house. Located in a premium school district, along a cul-de-sac, the house is a South-facing brick front home built with a nod towards a classic “four square” design. 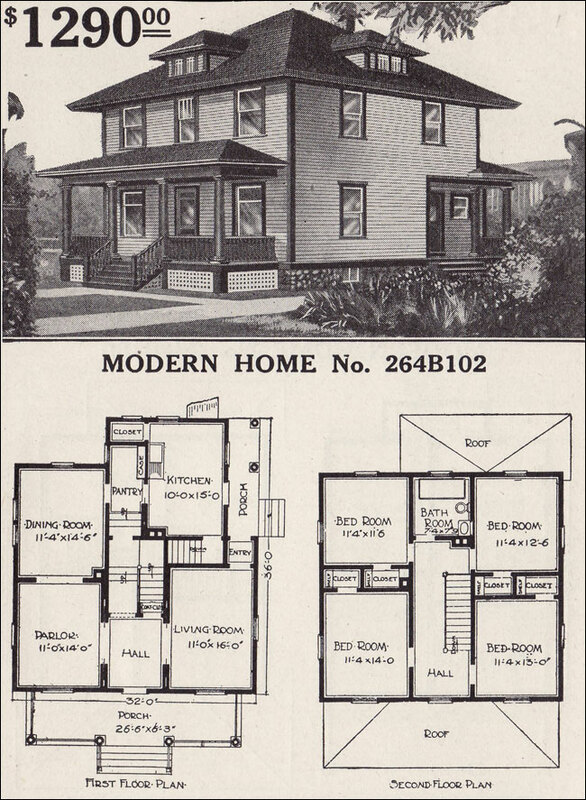 It has four bedrooms on the top floor, one on each of the four corners. Each bedroom is separated from the other by either a closet or bathroom, so even with two small children, all of the bedrooms are quiet and peaceful. But, because it also has an attached garage, it has a large bonus room above the garage and a large family room behind it, open to the kitchen. It had a fenced-in backyard with room for a swingset, and a deck that stayed cool and shaded in the summer. It was perfect. The classic Four Square home. After that first tour, my husband asked me to rate it on a scale of 1-10. It really was. The kitchen in our current house is very functional. 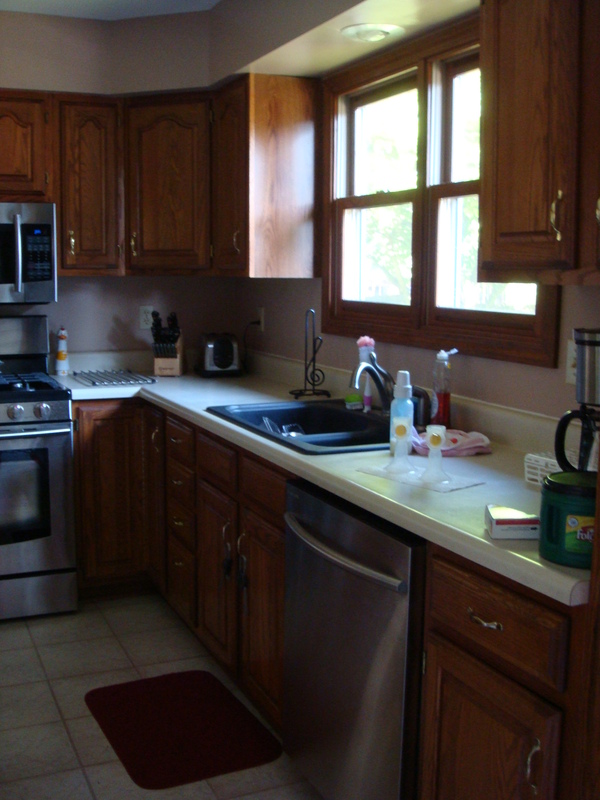 It has a small island, a great work triangle, good prep space, and plenty of cabinets (at least for my purposes. We do have a large buffet in our dining room that houses all of the bigger serving platters that usually only make an appearance around Thanksgiving and Christmas. But even that isn’t packed full. If push came to shove, I could certainly store all of my kitchen accoutrement in the actual, physical kitchen). But it was clearly getting a little dated. Built in 1992, it is a shrine to the dark, heavy oak and brass fixtures that were considered the height of sophistication at that time. Honest Dad and I have an aesthetics of mid-century modern with a splash of old-school. He loves large, shiny, clean black surfaces, and I love to dress them up with bright, patterned fabrics. We prefer grey and white to beige. I think that certain shades of purple and blue can be considered “neutral.” Ikea has had a hand in the furnishing of every single room in our house. 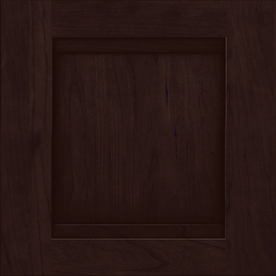 Dark oak, cathedral style cabinets with beige laminate countertops just ain’t our thing. But it worked. It had a breakfast nook, and opened up into a sunken family room with a large, brick fireplace and 16-foot ceilings. The girls could play in that room while I cooked, enjoying the brand new, state-of-the-art stainless steel appliances, while Honest Dad and I saved up for the eventual inevitability of a fix-up/remodel. And when we moved in, that was our plan. Live with the dark kitchen for now, and in a decade or so, as the girls grow, look into remodeling. But we weren’t in the house very long before some very real concerns arose in the kitchen. The first thing that I noticed was that the countertops felt sticky. All the time. No matter what I did. No matter what cleaners I used. Sticky. Or at least, tacky. All over. I told Honest Dad about it. We scrubbed. He brought back industrial strength cleaners from work (he works in aviation, so these cleaners are designed for some serious grime!). I coughed and wheezed from the fumes, and worried about Honest Baby, swimming around in my womb and absorbing all of these horrific chemicals. Nothing worked. Tacky. Sticky. And stained. For some reason, these countertops would stain within seconds. Red wine. Fruit juice. Indian takeout. If any sauce or fluid dripped on the counter and sat for longer than 30 seconds or so, I had a new stain to add to my growing collection. I once set a bag of tortillas down on my island while putting groceries away, and when I picked the bag back up, there was a perfect mirror-image of the label. Emblazoned across my kitchen island. Desperate, we started scraping and polishing. We scraped the entire top layer of laminate off. The top layer of laminate was destroyed. Melted, for all we could tell, probably by some kind of harsh cleaning product not intended to be used with laminates. Suddenly, my functional-yet-dated kitchen was depressing. As a stay-at-home mother, I spend about 80% of my time in my kitchen, and these countertops were making my time much more difficult and distracting than it needed to be. And potentially dangerous. Without the protective coating on the top of what is essentially pressed paper, I can only imagine the bacteria and diseases that are now setting up shop on my countertops. How could I keep Honest Girl safe while we baked brownies? What about when Honest Baby starts eating solids? Every time I slice chicken or crack an egg, I just think about the horrors that are slowly seeping into my family’s space. Then, there was the microwave. The old owners, in an attempt to make the house more appealing in a difficult housing market, had purchased an entire suite of beautiful stainless steel appliances. Including an over-the-range microwave with a built-in vent. 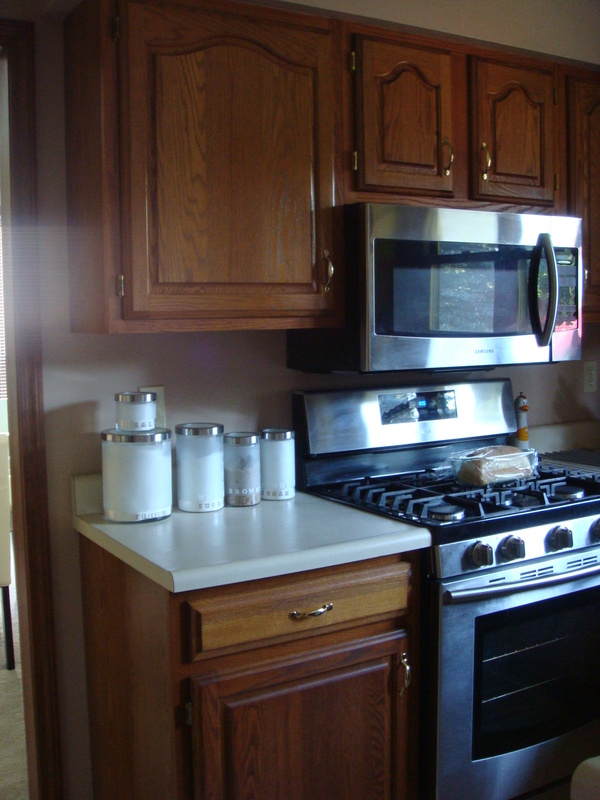 But, in order to save money, the owners didn’t replace the upper cabinet on top of the microwave. So it was low. Very low. I only have about 11 inches of clearance between my stovetop and the bottom of my microwave. On one hand, that works great for me when I use the microwave. I’m only 5-foot tall, so if the microwave was six inches higher, I wouldn’t be able to even see inside it while trying to use it. On the other hand, it means that cooking on the stove is a continuous challenge. My tall stock pots fit, but not with a spoon and my hand. Also, the bottom of the microwave gets splashed with grease and sauce no matter what I do. Finally, because it sits so low to the steam and heat of the cooking, the stainless steel has actually started peeling off the bottom of the microwave. Seriously. There’s a little flap along the bottom of the buttons that has lost its ability to stay attached to the face of the microwave. On a side note, I have to say that I have also always been less than impressed with the built-in ventilation capabilities of over-the-range microwaves. They’re just not powerful enough to actually move the smoke away fast enough. So, we started talking about what we could do to improve it. First, we said that we could just paint out the dark oak, replace the brass hardware, and replace the laminate. These were all jobs we had done before in our kitchen at our old house. But as we discussed our needs and wants for our kitchen in this new home, in this place that would see our children start and finish school, in this place that was no longer a “starter home,” but where we will be for the foreseeable future, things changed. As we discussed budgets, time, DIY projects, and, of course, style, it became clear that just a refreshed kitchen wasn’t going to give us the kind of return on investment we were seeking. Thus began the planning of our full, floor-to-ceiling kitchen remodel. For months now, Honest Dad and I have discussed and researched cabinet boxes, cabinet doors, floor tile options, backsplash tiles, paint colors, layout, countertop options, drawer inserts, hardware, sinks. We went back and forth on every aspect at least three times. We discussed, agonized, scaled back, then charged forward again, only to creep backwards. We created 3D models. I placed sticky notes on my cabinets, trying to decide where the optimal locations would be for spices, plates, spoons. Would the optimum set up be something highly functional and streamlined, or should I try to shove the maximum number of cabinets in? What was the best balance? For months now. Just last week, Honest Dad and I sat down and ordered samples of high quality laminates (the biggest bang for our buck, in my opinion. Sturdy, durable, able to handle two young girls who love to “help,” and cheap enough that in 10 years, if we decide to rip them out and install a beautiful granite or quartz, we can). How much have we been working on this? The other day, I was going for a walk with my next door neighbor and good friend. I was talking about the kitchen. 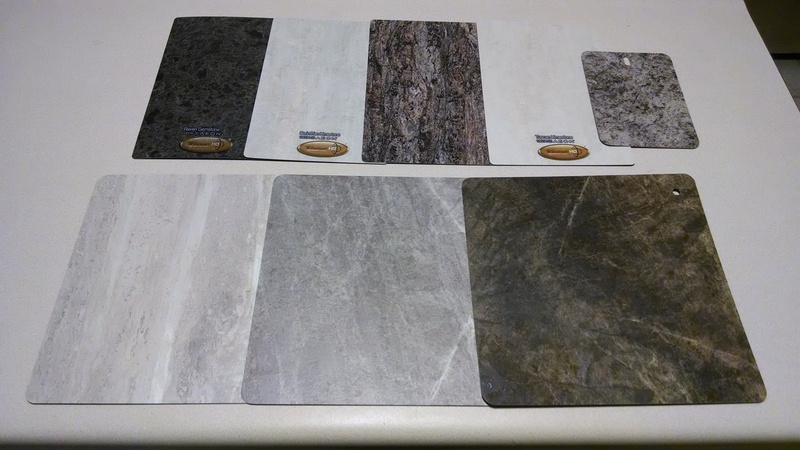 Our laminate samples! The official start to everything. The bottom center sample is the clear winner, in my mind. 2014 will be the Year of the Kitchen. We are giving ourselves an entire year to complete this remodel (I think that’s reasonable for a complete DIY project of such magnitude). We have things organized into stages. First, we need to level the floor. It has to happen before anything else can be done (There is a noticeable slope from the island to the dishwasher). Then, we will rip out the floor-to-ceiling pantry that’s currently blocking the gorgeous natural light from our 6-foot windows in the breakfast nook. We’ll convert the closet in the adjacent laundry room into a walk-in pantry. Then, the real construction begins. The uppers will come down. Then the soffit. The ceilings will need to be repaired. Plumbing, electrical, and ventilation all moved. Recessed lights installed throughout (right now, we only have one ceiling light for the entire kitchen). Ikea cabinets purchased, arranged, and assembled. Countertops built. Drywall repaired. Cabinets installed. Backsplash. Paint. Electrical outlets. Grout. Sealers. Plumbing. Gas. Water. And a million other little things that I’m sure we’ll discover as we go along. So don’t be surprised if this blog suddenly transforms into a mostly-DIY blog. I will still be writing about kids, current events, pee and poop, to be sure. But I’ll be doing it from a construction zone. I’m sure that I’ll need to get on here and scream a few times throughout this process. Or cry. Or justify. Or explain. Or lament. And I’ll need some encouragement. And maybe even some advice. This won’t just be a terrifying adventure for me and my family, but for you as well, my online community. So, get ready. The Year of the Kitchen is here. A little inspiration. This kitchen is almost exactly our layout. 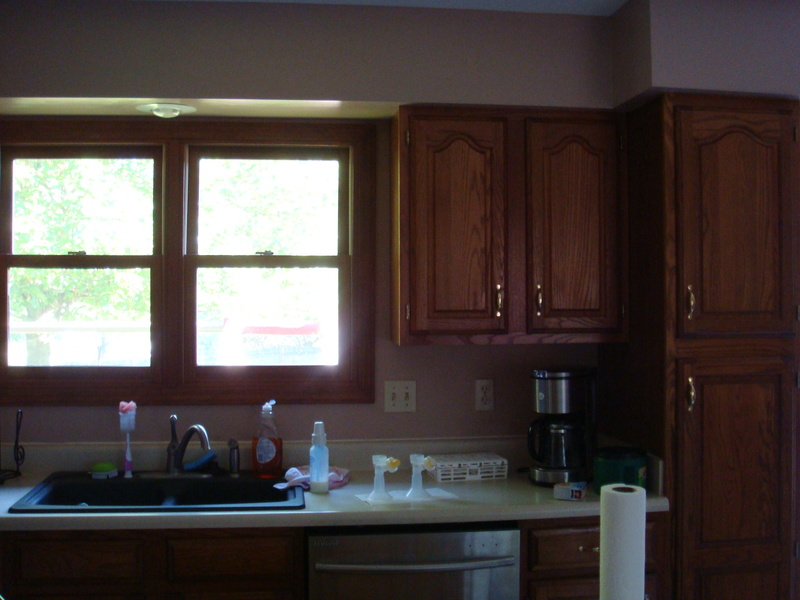 They also used the Ikea Ramsjo (Shaker style) cabinets we selected.